On a beautiful sunny day, shortly after Christmas, 12 teams gathered together for the Borders Hockey Development Festive Family Fun Festival. The event provided an opportunity for more than 100 players, of all ages and stages, to run off some of the Christmas pudding and mince pies and have some fun playing six-a-side hockey at Tweedbank. 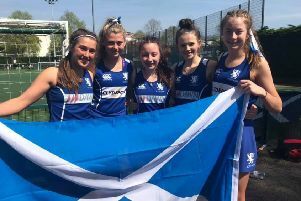 “Every game was played in the spirit intended, with lots of enthusiasm and healthy competition, lots of laughs, banter and memories made,” said Borders hockey development officer, Janet Jack. The Pitman Trophy was played for, and it was eventually awarded to the Bell/Hulmes for demonstrating great teamwork, support and sportsmanship. A huge festive thank you has been extended to all the participants, spectators and volunteers who came along to support the event, both on and off the field, along with the soup and sandwich makers, and Gordon Newlands for taking photos.